The hybrid zone is probably one of the most visible and well-known spaces in the city yet also one of the most forgotten and undervalued spaces. A bench or pots, plants and other personal objects placed on what seems to be the sidewalk create a subtle transition zone, the hybrid zone. Most of the time you will only notice a sudden transition from public to private space — not maintained, not claimed, and not personalized. Yet the hybrid zone (1) plays an important role in establishing contact and interaction between city-residents and creating a friendly, welcoming, and attractive street environment. 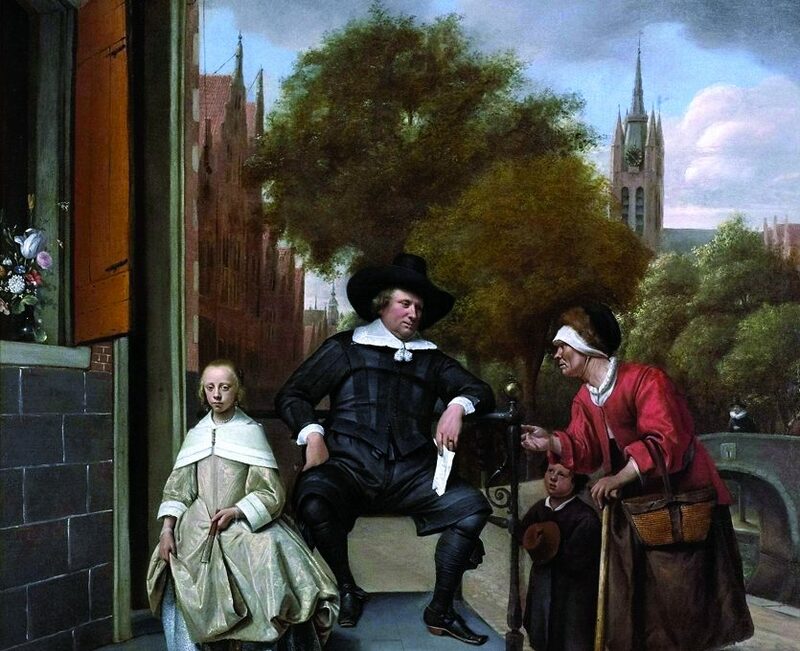 The hybrid zone originates from a 15th century Dutch concept, the Hollandse stoep (“sidewalk”), as a response from residents to the increasing trade and traffic in their city. Traders made a small platform about 1.25 meters wide and elevated above street level, accessible by stairs with storage underneath for merchandise, to show their goods. 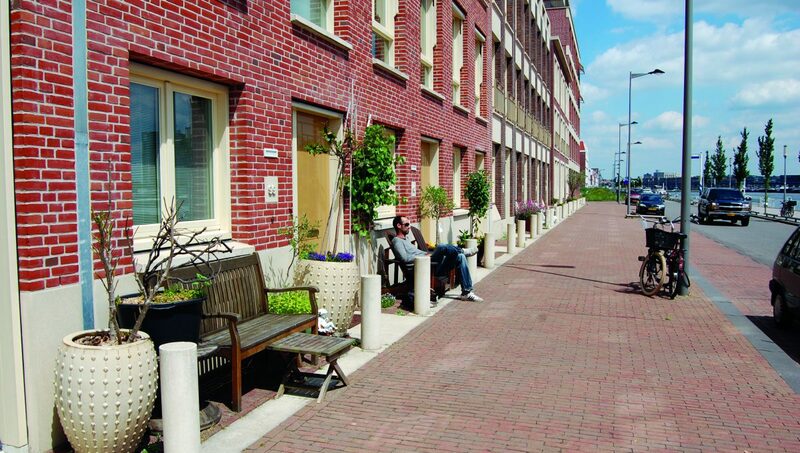 In residential areas, the Hollandse stoep was an ornamental private sidewalk, creating distance from passing traffic, but also allocating a private space for social contact and observing public life. It created a very distinct space between public and private. Our multidisciplinary research team (2) set out to understand why hybrid zones are not consistently well-used and maintained. We conducted extensive research on how physical aspects of the hybrid zone impacts social behaviour. 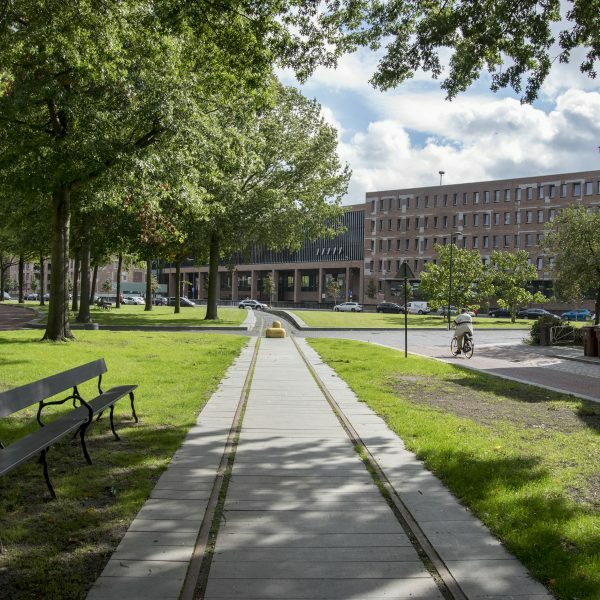 We analysed all 6231 streets of Rotterdam, the Netherlands, using Google Street View. Observations and measurements showed a well-used and maintained hybrid zone (measured by the amount of personal objects in the space) when the hybrid zone was between 1-2 meters wide. Neighbourhoods with more apartment buildings, rental homes, lower home values, and higher densities had fewer well-used hybrid zones. Besides physical aspects of hybrid zones, social aspects are also apparent. Taking ownership or “claiming” the hybrid zone brings a certain flair to the street. It becomes personalized and it actually looks like it belongs to someone. This “belonging” impacts the immediate social atmosphere by enabling social identification. The hybrid zone, when claimed, allows people to judge, relate to, or identify with others. Passers-by and neighbours can speculate over this claimed space: Does this person have the same interests or same activities (is there a bench or children’s toys); do they like the same music (based on sounds coming from the house); do they like the same kind of food (judged by smells)? Objects, behaviour, sounds and smells can all be reason to start a conversation, so that through the hybrid zone people can ‘get to know’ each other. This social identification works especially well for people living close by, such as neighbours in a street or people living in the same apartment building. A personalized space can give just enough information to initiate contact with a neighbour, which can prevent trouble caused by neighbours not knowing each other. 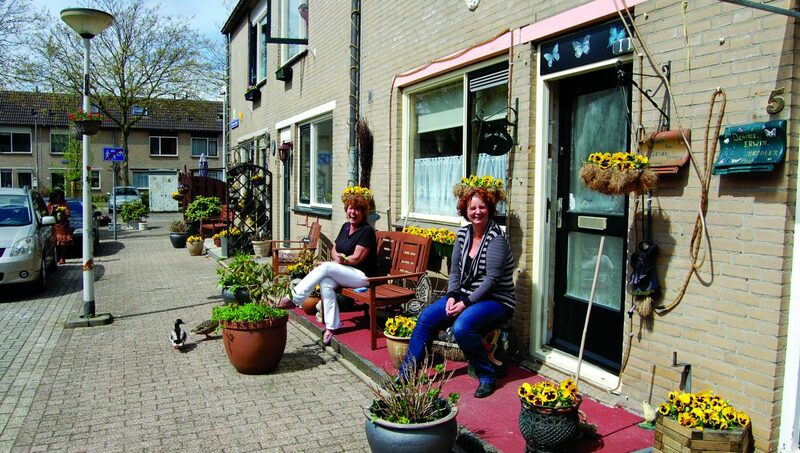 In fact, about 80% of informal contacts between neighbourhood residents occurs in hybrid zones. (3) As expected, our research showed that people who have claimed their hybrid zone have more contact with neighbours while being in their hybrid zone. The hybrid zone contributes to public familiarity. More unexpected, the results showed that these people also make more appointments to get together with neighbours. The physical layout of the street does determine the amount and ease of social contact. 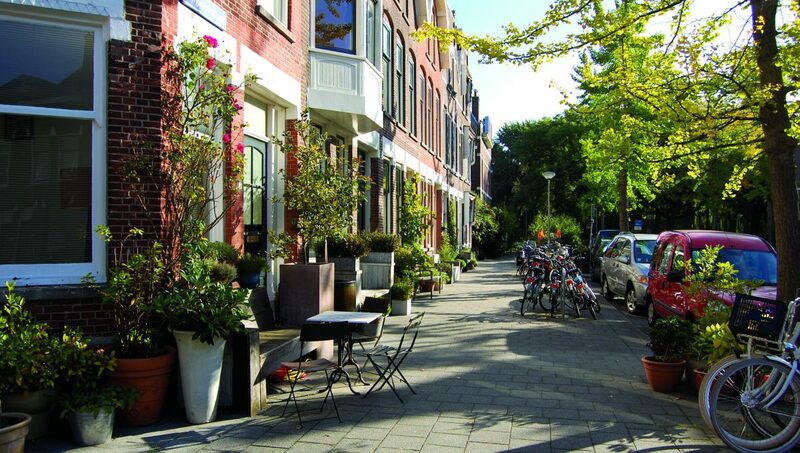 In wide streets with broad views there generally is less social contact between neighbourhood residents. Claiming the hybrid zone also creates privacy, especially when the sidewalk borders the façade of a building. Usually residents complain that people walk too close to their homes and try to look through their windows. They respond by closing their curtains, sometimes all day and night. By taking ownership of the hybrid zone, they create a buffer between public and private. Plus, it gives people something pleasant to look at while passing by. 1. Machiel van Dorst, professor at the University of Delft, first mentioned the term hybrid zone. 4. Brown B. B. (1979). Territoriality and residential burglary. Paper presented at the meeting of the American Psychological Association, New York, NY. The most stunning results of our research demonstrated that most residents don’t claim their hybrid zones simply because they are unfamiliar with the rules and possibilities of the hybrid zone. Much can be done to support and promote better use of the hybrid zone. For example, municipalities and local community groups can inform residents the ways in which they can adopt and take care of their part of the sidewalk. Not to fence off public life, but to extend home, experience more personalized space, and improve social contact. Local government and developers also play an important role. They should make sure there is a place for people to naturally take ownership over. For example in existing situations where people are allowed to remove 1,5 tile of the sidewalk to make their own small garden. Also in new situations developers should reserve space where a well functioning hybrid zone can be created. Although the hybrid zone here has mainly been described in the context of living areas, conclusions concerning ownership and the beautification of the sidewalk, also apply to shop-owners in shopping areas.